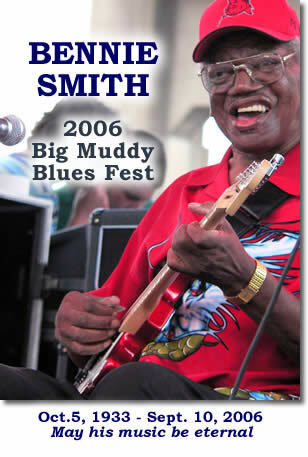 Mr. Bennie Smith, the 'Master of the Stratocaster' here in St. Louis, lost his battle to lung cancer and the complications of this horrible disease on Sept. 10, 2006. He was surrounded by his friends and family. Bennie touched the lives of countless music fans and musicians, and his music and spirit will live forever through those who knew him! Bennie performed as recently as the 2006 Big Muddy, with his love of music evident by the smile he shared with all the fans on hand. Over the years, Bennie became a good friend to STLBlues, shared his life story with us, and gave us so many moments of sheer musical bliss. We'll miss him dearly, may his music be eternal.